Got a Bamboo Fun Tablet by Wacom ($199) and have been experimenting with drawing and painting in Photoshop CS5. 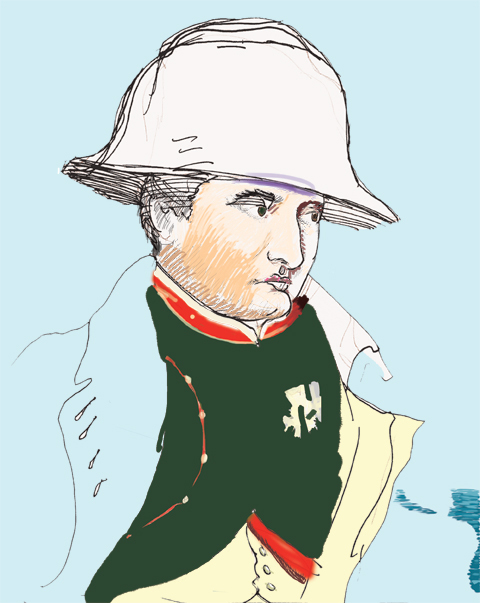 For this portrait of Napoleon, I began with a single reference image, an old print I bought in England over twenty years ago. I was in a used bookshop in Greenwich and found it in a box of loose prints and asked how much. The bookseller glanced over his bifocals and said, “10 pence.” I would have paid twice that. It’s a lovely little example of a printing process called chromolithography. Apparently, it is an illustration separated from an old book, circa 1900. 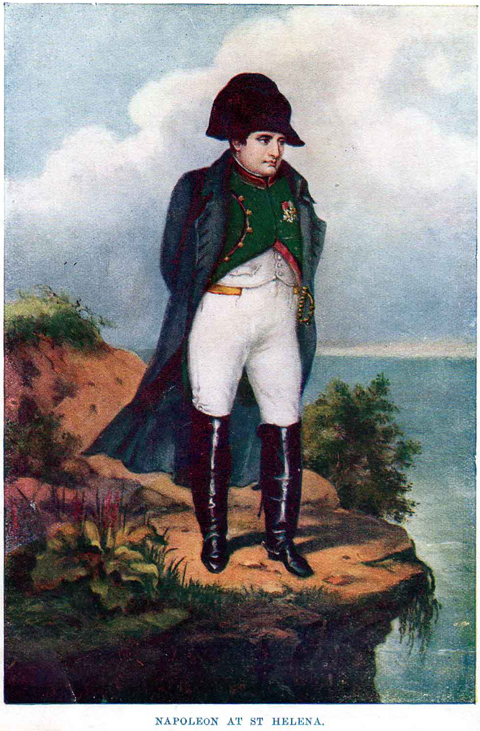 The original print depicts Napoleon in exile at St. Helena. In a rather surreal pose the general stands alone, his face in the wind, dangerously close to the cliff’s edge. One detail that strikes me as most peculiar is that Napoleon is carrying a sword. I don’t know much about how he was treated during his forced exile on St. Helena, but that detail seems unlikely. The uncredited illustrator has successfully captured the psychology of the forcibly retired Emperor, lost in thought. He has a pensive, ‘It is what it is’ look that I hoped to capture. A Xerox Machine Made of Meat? I inked directly over my quick pencil sketch. Without even erasing the pencil, I scanned my crude image and made it the base layer in Photoshop. I poured in a blue background. This gave me an idea of the sky’s tone, but more importantly the light blue is far easier on my eyes than a bright white screen. I started sketching in the skin tones with a Photoshop brush and within an hour my ink sketch was totally covered. Now, I know Photoshop has a feature for rendering clouds, Filter -> Render -> Clouds. I found a nifty photoshop cloud tutorial here thanks to Michael Skora. I tried the exercise a few times, but found my Photoshop clouds didn’t have the ephemeral beauty of real clouds. Rather than swipe someone else’s super cloud photo via Google image search, I looked through my Iphoto files of my recent trip to the Yucatan. I was on top of Maya pyramids with unobstructed sky views, but most of my pictures were snapshots of friends. 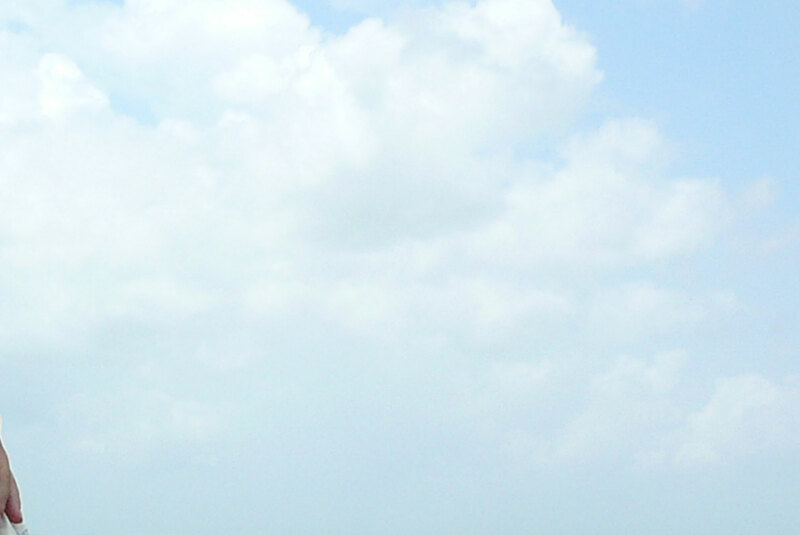 I found one with lovely clouds against a pale blue and cropped out the people. Notice part of a friend's hand shows in lower left of my cloud shot. 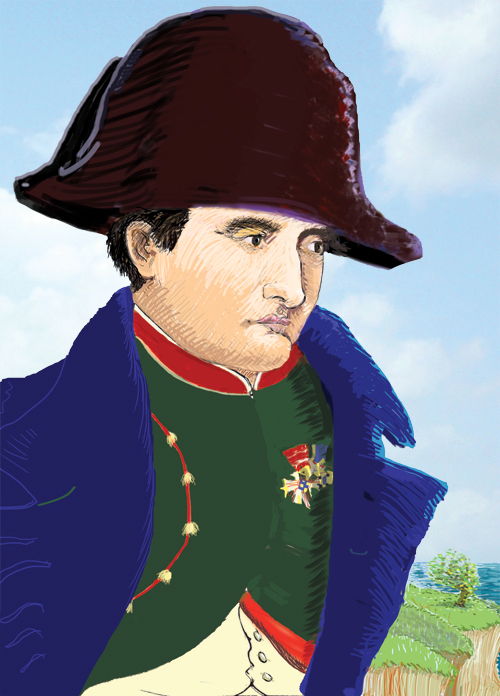 I placed the cropped cloud photo on a layer below Napoleon. 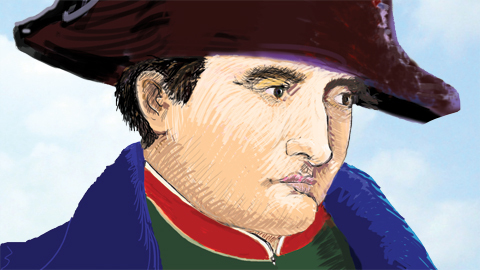 I applied Photoshop’s Brush Stroke (Angled Strokes) so the sky appears less like a photo and more like my digitally painted Napoleon portrait. This might sound like I’ve gone over to the dark side to become a Xerox machine made of meat. However, I used my own photo-reference, and in my mind, the portrait is the essence of this picture. Notes: Since I posted this I find myself looking at the sky more. With Hurricane Irene we had some quite dramatic clouds here in Kutztown. Kutztown Cemetery is one of the few places in town without utility poles blocking the sky. I spent some time on the hill in the graveyard capturing clouds with my digital camera. I may update this image with more spectacular clouds. Xerox is a registered trademark of the XEROX CORPORATION. < Previous KUTZTOWN, Where the Wild Things Are! Next > Don’t Call it Sharadin Gallery Anymore. I enjoyed reading this post too and I liked the Speigelman quote. I like that you used your own ref. for clouds. I find I can’t stop taking pics of the sky too. 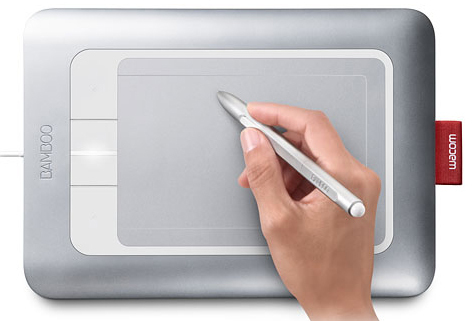 Mostly this is a good explanation of making an illustration your own even with using some technology. Hi Madeline, Thanks. This portrait is a demo for an illustration 1 class, and besides the tool, I try to demo ethical practices about reference. At some future date I will write more about using others’ art as reference. Lincoln Cushing has a good essay on that, Best Practices for using the Graphic Artwork of Others.